Alex Hammond, West Virginia’s chief of staff for football, had been familiar with Tracy’s story. He knew that almost 20 years ago she said she was raped by four men, two of which were Oregon State football players, and that she’d spoken to several college programs in 2016 about the realities of sexual assault. “We all agreed that this would be someone very valuable to speak to the team,” Hammond said. Last week, Tracy spoke to the Mountaineers. She told FOX Sports it is probably the 25th college football program she’s spoken to in the past year. Oregon State was the first, back in the fall of 2015. 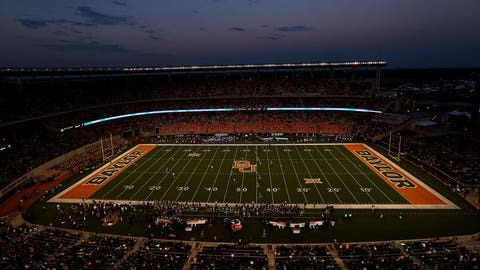 The need for Tracy and other anti-sexual violence advocates has always been important, but the issue has become dramatically more prevalent in the sports world in the last year in the wake of Baylor’s ongoing sexual assault scandal — as well as the attention generated from the Joe Mixon story at Oklahoma, among other incidents. Tracy, though, says she’s careful not to hang blame on the players she’s speaking to, instead engaging them as being the most important players in putting a stop to sexual violence. “The other thing I do is I tell these young men that I don’t consider them the problem,” she says. “I consider them the solution to this epidemic and this problem, and it’s the good men that need to start speaking out. There are, of course, other hurdles to getting the message through. Tracy sees a culture of entitlement around young men, especially in sports, as well as a prevailing ignorance that tends to excuse away assaults influenced by alcohol. And that’s a big problem. Despite the challenges, several of the West Virginia players seemed to take Tracy’s message to heart — at least to their Twitter accounts, sending out her mantra: #NotOnMyCampus. Tracy, though optimistic, knows that Twitter is a long way from meaningful action. West Virginia, like most of the other programs that invited Tracy to address their teams, wasn’t trying to do any digging out from a scandal or do damage control. Instead, the goal was to educate their student-athletes and raise awareness to the issue of sexual violence, to prevent it from happening. Tracy got a lot of attention stemming from her visit to Baylor last July at the request of interim head coach Jim Grobe, who had replaced the fired Art Briles just over a month before. She told FOX Sports that the tenor of her presentation to the Bears football program — at the time, still in the very thick of dealing with the ramifications of the scandal — was very similar to what she said to West Virginia and other football teams. Tracy felt like she had a productive meeting with the players and in her time with Grobe. 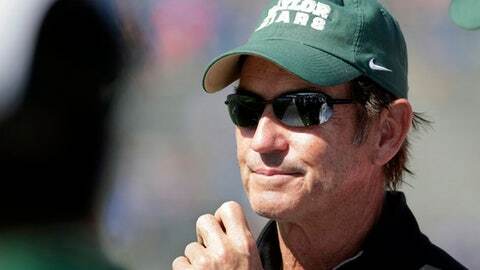 But then a member of the Baylor coaching staff asked to speak with her. In the months since then there have been more ugly headlines and allegations out of Baylor, as well as a coaching change. Matt Rhule was hired from Temple to take over. 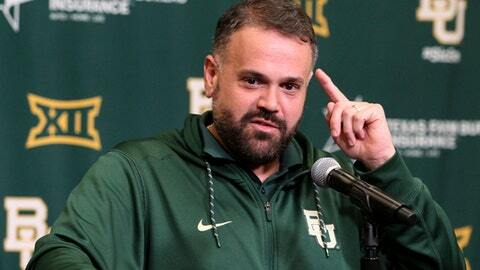 Rhule’s reputation within coaching is very solid, but there have been two embarrassing incidents involving staffers he has hired — and then let go. While to some, the actions of Rhule assistants shouldn’t be tied to what went on under the former regime, Tracy has been very vocal about the culture that she says still exists at Baylor. Tracy noted that she appreciates Rhule and believes he is trying to address the problem. But she also thinks he is just “one piece of the puzzle” to fixing the deep-rooted problems at Baylor that have brought issues of sexual violence and dangerous cultures of entitlement in sports to the forefront. That sentiment might be the essential conflict Tracy, a registered nurse with an MBA, has to overcome to succeed — the desire to win at all costs vs. doing the right thing. Her Twitter feed now is a mix of the support she has received from her interactions with coaches and players and often nasty exchanges she’s had with Baylor fans, especially since she’s advocated for the Bears football program to get the death penalty. Some think — incorrectly, she says — she’s trying to take football down with Baylor. Despite the skeptics and obstacles, despite the long road ahead, Tracy sees hope in the amount of coaches that have engaged with her, like SMU’s Chad Morris, Oregon’s Willie Taggart and South Florida’s Charlie Strong. “That teams are proactively seeking me out tells me that they want to change and they want to be part of the solution,” she says. 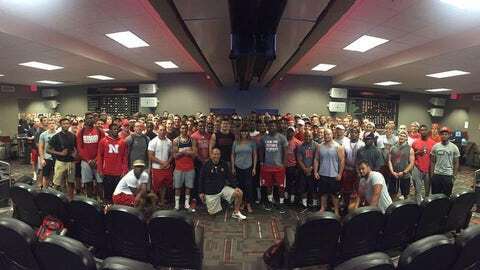 “A lot of good coaches want to change the culture and raise awareness through sports. After I leave, a lot of teams put teal ribbons on their helmets. Wyoming just had a basketball game dedicated to survivors. We’re in the beginning stages, and nothing changes overnight. In the next week, Tracy plans to launch a campaign called “Set the Expectation.” (“If you don’t set the expectation,” she says, “how do you expect our men to meet it?”) She is pushing for coaches, players and parents (if high schools teams agree to take part) to sign a pledge that says the player understands he will be removed from the team if he commits such an act of violence.